So Easter is apparently really soon. Say what!? Time seems to go too quickly. We don't do much with our family, but we do go to my husband's grandparent's house for a big Easter breakfast. Although we don't do an actual meal at our house, I still like to make easter related dishes in the few weeks leading up to the holiday. Bunny bait is my kid's top choice. 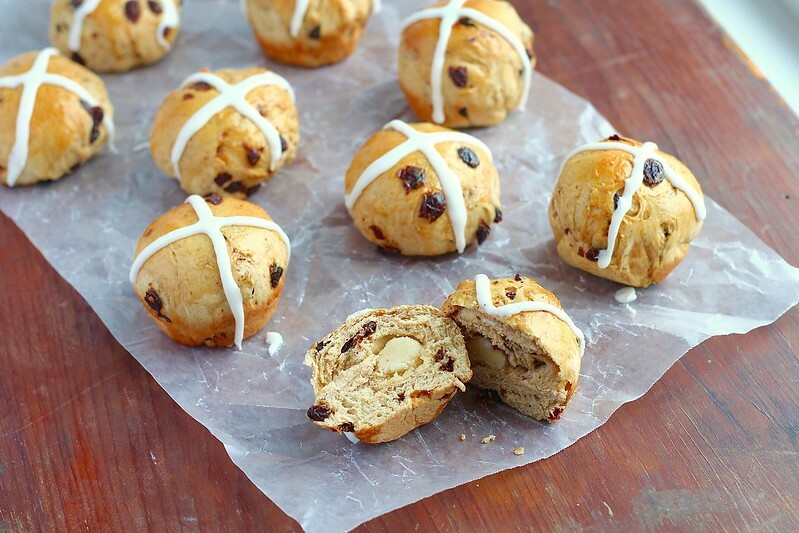 Hot cross buns are one of my favorites. I've been making the same recipe for some time now, so I thought it was time to ramp it up a little! When I saw this recipe for boozy bread, I couldn't have been more excited. And it has marzipan in the middle! Eeekk!! If I didn't have any self restraint, I would probably eat marzipan straight from the container. 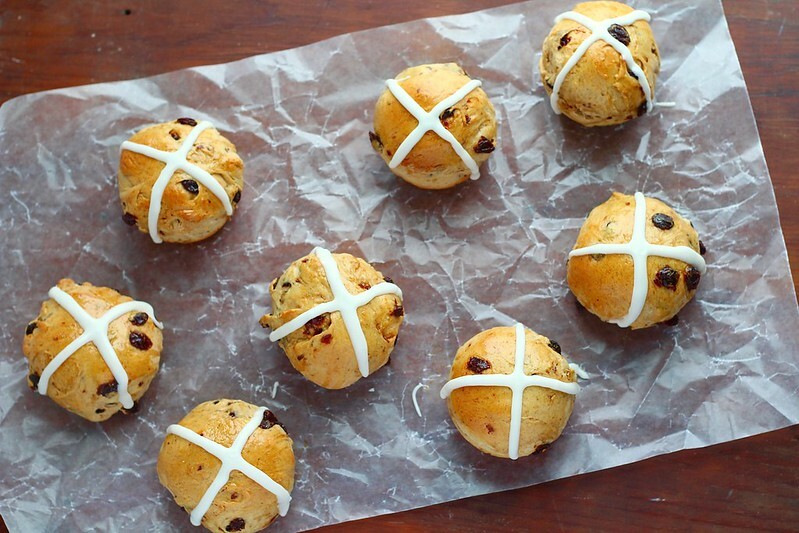 These definitely need to grace your table this Easter. Let me break these rolls down for you. First, raisins are soaked in a rum mixture, then drained. Then, they are mixed into a wonderfully spiced dough. The dough rises for a bit, then portioned out and rolled into balls. Little pieces of marzipan are tucked in the middle of each roll. The rolls rise again. The rolls are then baked, glazed with the leftover raisin rum soak, cooled then crossed with a confectioners' glaze. Perfection! If you aren't comfortable serving your kids these, you could always soak half of the raisins in rum for the adults, and add plain raisins for the kids. Either way, you'll love them. In a medium bowl, combine the raisins, warm water and sugar. Cover with plastic wrap and let soak for at least 40 minutes. Pour the raisins and liquid through a strainer placed over a bowl. Save the drained liquid and set aside the raisins. To make the buns, combine the warm milk, yeast and 1/4 cup sugar in the bowl of a stand mixer. Let sit until the mixture is foamy, about 10 minutes. In a separate large bowl, whisk together the flour, remaining 1/4 cup sugar, salt, cinnamon, nutmeg, and allspice. Fit the stand mixer with the paddle attachment. Turn the mixer on to low speed mix in the drained raisins with the yeast mixture. Then, add half of the flour mixture and mix just until combined. Beat in the melted butter and eggs. Gradually mix in the remaining flour mixture. Mix until a rough dough forms. Switch to the dough hook and knead on medium speed until smooth, about 5 minutes. If the dough is too sticky, add 1 more tablespoon of flour, at a time, until a soft and supple dough has formed. Grease a large bowl and form the dough into a ball. Place in the greased bowl and turn once, to coat with oil. Cover with plastic wrap and let rise until doubled, 1-2 hours. Line two baking sheets with rubber baking mats, or parchment paper. Set aside. After the dough has risen, gently punch down and turn out onto a work surface. Let rest for 5 minutes. While the dough is resting, divide the marzipan into 16 equal size pieces, then roll into small balls. After the dough has rested, divide the dough into 16 equal size rounds. Place a ball of marzipan in the center of a roll then pull the sides over it. Roll into a ball. Repeat with remaining marzipan and dough pieces. Place on the prepared baking sheets, seam side down, spacing about 2 inches apart. Drape plastic wrap over the pans and let rise until puffy, about 20-30 minutes. Meanwhile, preheat the oven to 375ºF. Make the egg wash by whisking together the egg and 1 tablespoon milk. Using a pastry brush, brush the wash over each roll. Place the buns in the oven and bake until golden brown, 20-25 minutes, rotating pans half way through. Meanwhile, place the leftover liquids from the raisin soak in a small pot. Bring to a boil over medium-high heat. Turn the heat down and let simmer until about 1/4 cup is left. 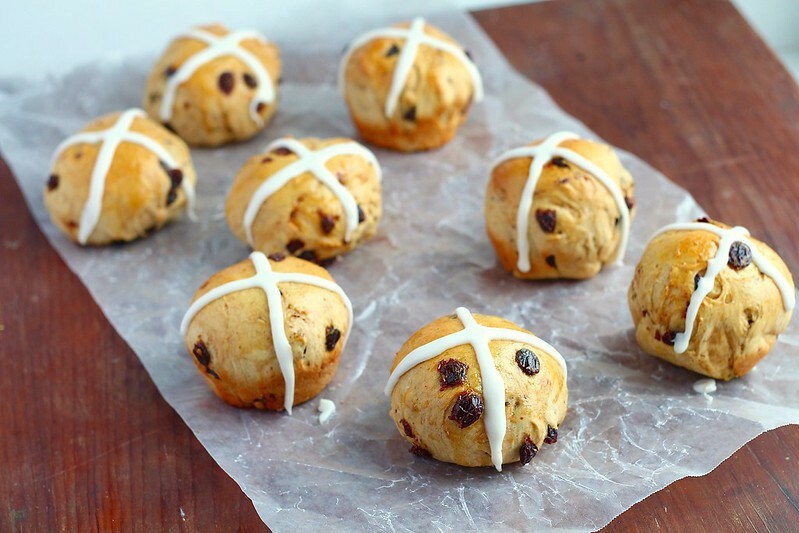 Once the buns are cooked, remove from the oven and brush the rum mixture over each warm bun. Let cool. To make the confectioner's cross, whisk together the confectioners' sugar and milk together in a small bowl. The mixture should be quite thick, but pipeable. If it is too thick, add 1 teaspoon more of milk, or if it is too runny, add a little more sugar until the right consistency is reached. Place a small round tip in a pastry bag and fill with the confectioners' mixture. 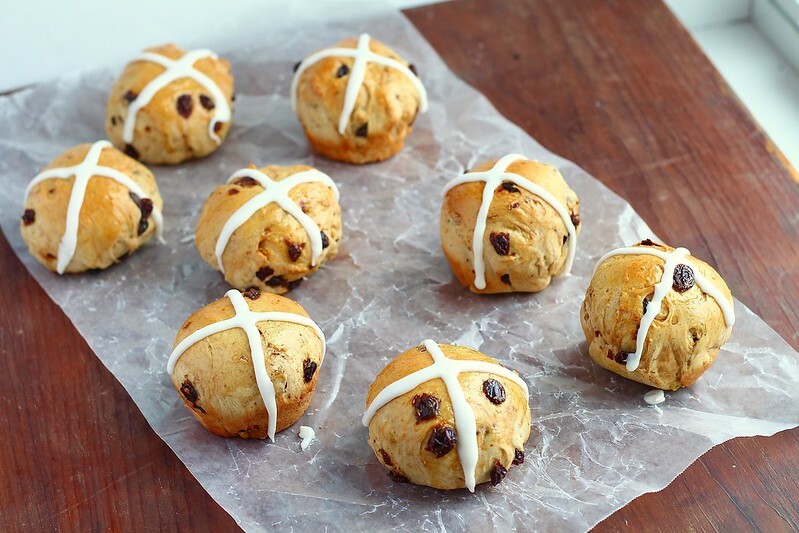 Pipe a cross or "X" over each cooled bun. Serve immediately or place, covered in the refrigerator for 4-5 days, warming before serving.